Are you literally tired all of the time? Can you never seem to get enough sleep? Has this made you irritable and/or forgetful, putting a strain on both your personal and professional relationships? If so, then the underlying problem might be a sleep disorder called sleep apnea. This condition affects about 25 million Americans, and for people in Horseshoe Bay, Dr. Sopel is able to offer a simple and reliable treatment that literally fits in your pocket. With it, you can finally get the rest you need and start feeling like yourself again. 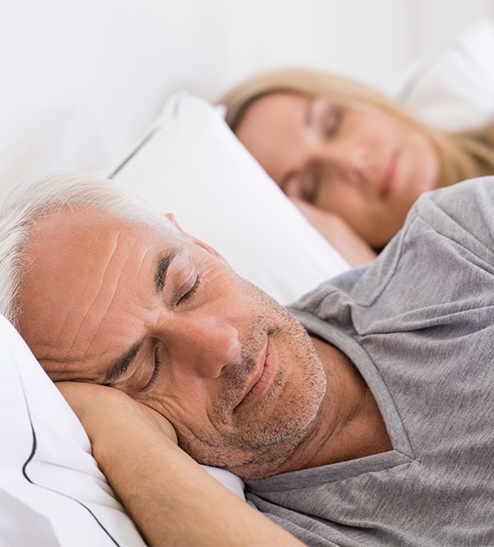 Why Choose Horseshoe Bay Dental for Sleep Apnea Therapy? When a person has sleep apnea, they actually stop breathing for short periods of time throughout the night, usually for less than 10 seconds. This can happen many times an hour, up to 100 in the most severe cases! For most people, this occurs because their airway is repeatedly becoming blocked by the soft tissues in the mouth and throat. Common symptoms include chronic exhaustion, loud snoring, weight gain, and an increased risk for both heart disease and depression. People with sleep apnea often develop hypertension because whenever breathing is cut off during the night, it forces the body to panic and work extremely hard to pump oxygenated blood. This increase in blood pressure can remain for several hours, making someone much more likely to have a heart attack or stroke. Plus, sleep apnea is very dangerous on the road as well, as drowsy drivers have been shown to get into accidents more frequently than even those who are intoxicated! While snoring is not always a sign of sleep apnea, people who frequently snore likely aren’t getting the best sleep that they can. And, people who snore have been shown to be at a higher risk of developing sleep apnea in the future. Not to mention, someone who snores can easily affect those around them, causing their partners, spouses, and children to lose hours of sleep every night. Thankfully, the same treatment we offer for sleep apnea can also be used to help someone stop snoring for good. To help our sleep apnea/snoring patients, Dr. Sopel can provide them with a specially-made oral appliance. This will fit over the teeth similar to an athletic mouthguard, and a patient will only need to wear it to bed. It will slightly shift the lower jaw forward, and this prevents the airway from ever fully closing during the night. As a result, a patient is able to breathe normally, sleep deeply, and wake up in the morning feeling fully energized. Dr. Sopel works hand-in-hand with numerous sleep physicians in the area to help sleep apnea patients get the treatment they need. If you have already been diagnosed with the condition and are sick of your CPAP, he can work with your sleep doctor to see if oral appliance therapy would be a good option for you. Or, if you still need to be diagnosed, Dr. Sopel can connect you with a nearby sleep doctor so you’re able to start getting the care you need right away.